I am not the type of person to get excited over a shish kebab. Yet, I couldn’t keep my cool when I came across these gems. To say that they tasted good would be an understatement. They were exquisite. 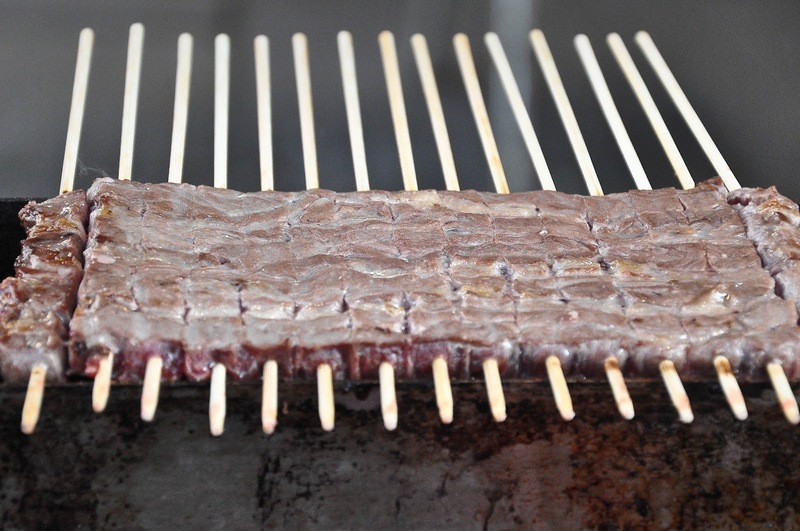 Smoky, satisfying and daintily cut into tiny squares allowing you to savour them with finesse, rather than having to open your mouth as wide as you can in order to take a bite from the indecent amount of meat served by your regular kebab shop. 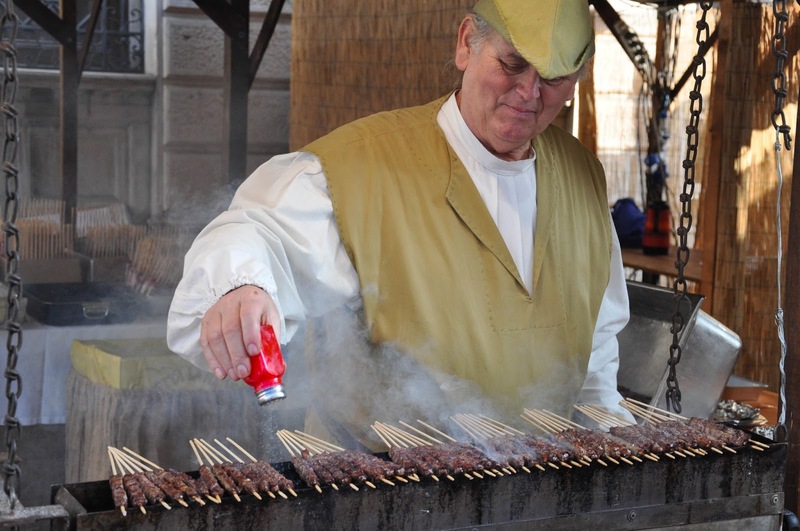 But then again, Italians know how to do food, even in the case of such an unpretentious dish as the shish kebab. 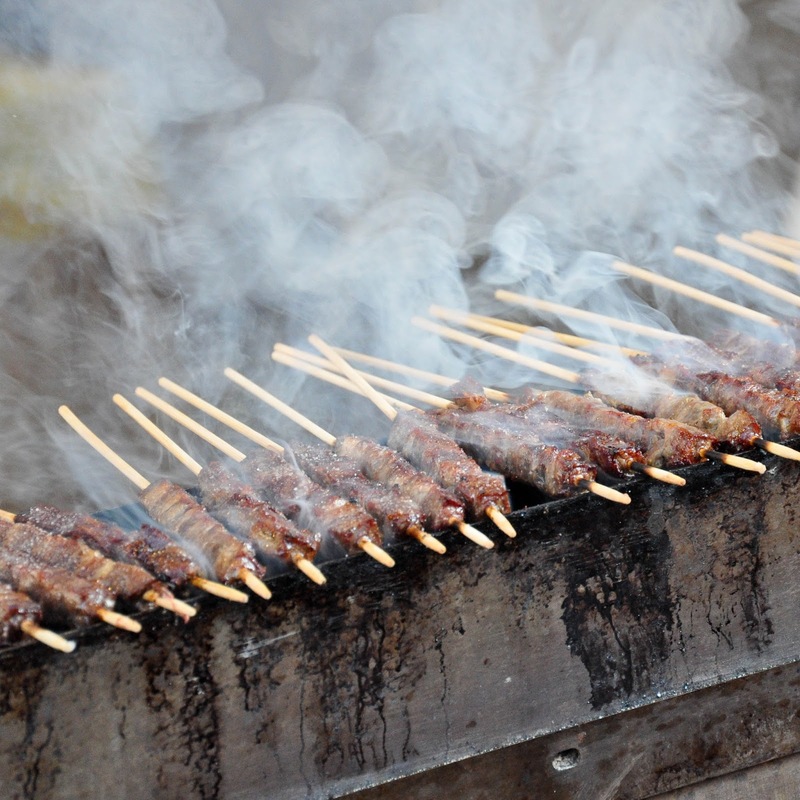 Which in its Italian version has the much more sophisticated name of ‘arrosticini‘. 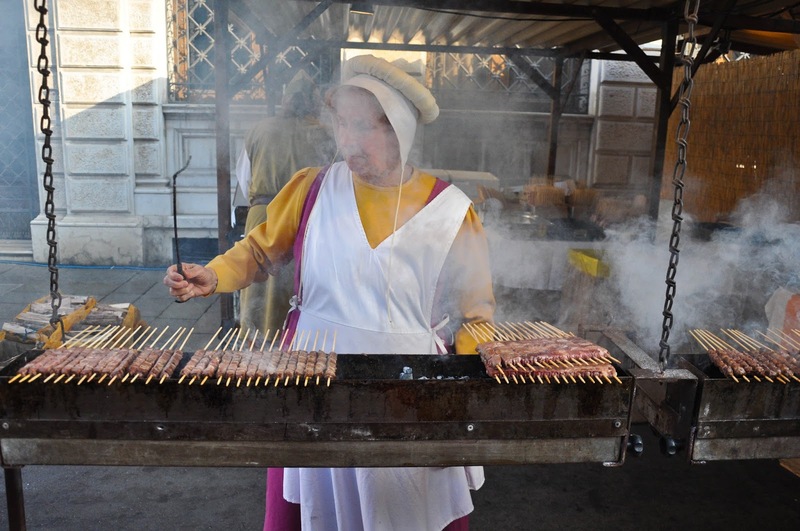 We had found ourselves in front of the arrosticini barbecuing and selling stall at the Christmas extravaganza in Thiene – an elegant city less than half an hour away from our current hometown of Vicenza. The streets of the city centre, lined up with beautiful painted houses, played host to a Christmas event with a petting zoo, horse riding, play area and arts and crafts stalls. As it is the custom at such events, the food stalls were the ones attracting the biggest crowds, so after having had our fill of petting a very docile cockerel, a goat, a lama and two gorgeous horses, after taking pictures of the wooden alpine house and the Nativity fountain and after marveling at the art installation showing Pinocchio in its comfortable room in the belly of the whale, we wandered off looking for food. 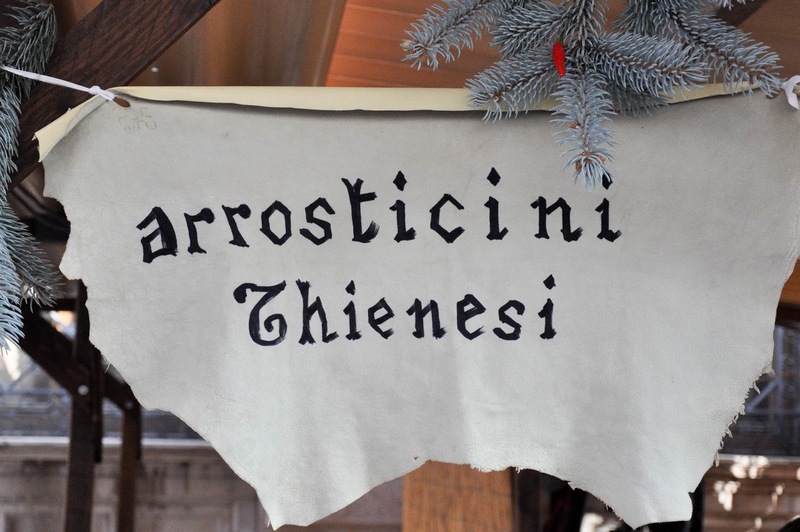 Just then a stall with a big sign ‘Arrosticini Thienesi‘ (arrosticini from Thiene) caught our eye. 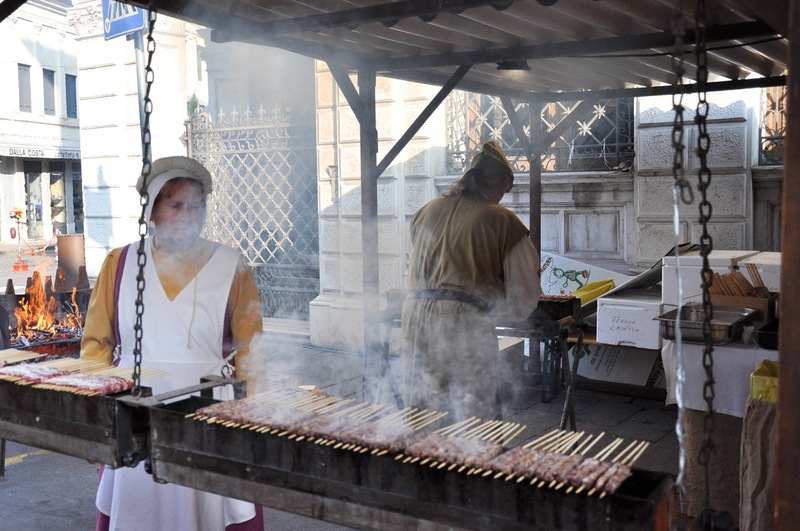 Dressed in medieval attire a mighty man was arranging the dainty spits with cubes of meat over the hot coals. 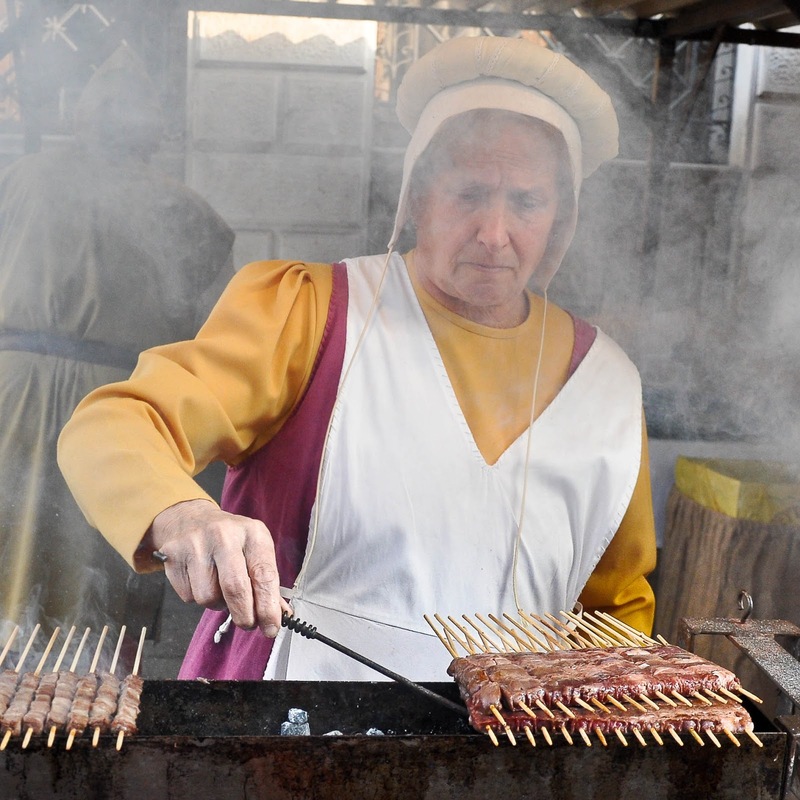 Every now and then a lady with a bonnet would scoop some more hot coals from a nearby flaming grill and pile them underneath the spits with roasting meat. People were queuing in their droves, buying dozens of the dainty spits and carrying them off like bouquets in their hands to savour and enjoy with their families. Obviously, we immediately joined in. Playing it safe at first, we bought six spits, which we shared fairly – two each. They were so good. 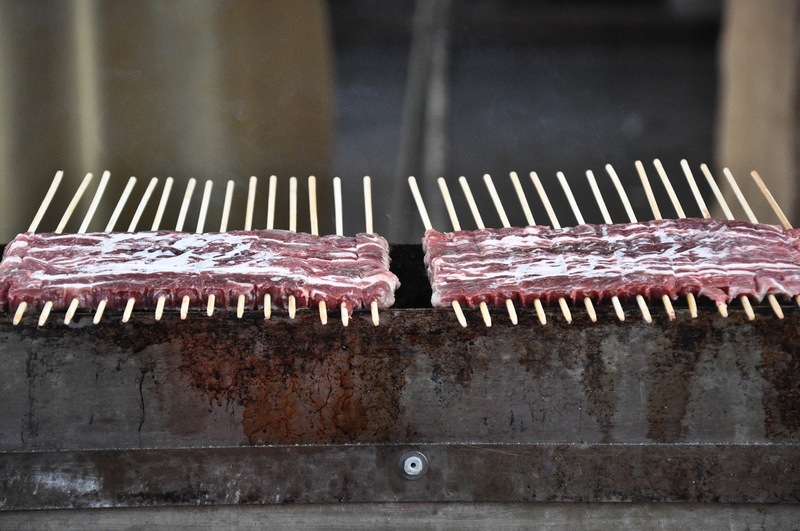 The small chunks of lamb meat were interspersed with little slivers of pearly fat. Here, I see a person who is very dear to me, roll her eyes in disgust – fat!? But, what can I tell you? In the right quantities, fat does give an amazing flavour to a meal. 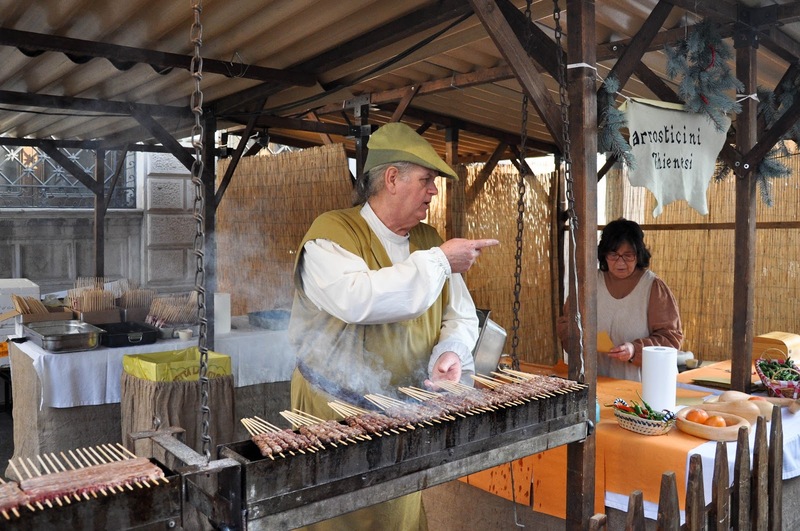 And were the quantities right in the dainty arrosticino I was holding in my hand? You bet! Add to this the generous helping of salt the man with the medieval attire would sprinkle over the sizzling meat as it roasted over the hot coals. Yes, it was a foodie dream! We had to go back for more. So, after waiting in line yet again, my husband returned victorious with several more spits. Soon, they were a memory, too. What a memory though! More like the highlight of a very enjoyable morning. Here is a little video for you to see it all in action. Enjoy!